Most of us believe that it is important as therapists and healers to be deeply present with our clients. But how do you teach this skill? Is it even teachable? In this brief video blog, Ron Siegel, one of ACEP’s conference keynote presenters, discusses three ways that mindfulness practice helps develop the ability to stay present. He also gives one specific tip that, for some us, will be a good reminder. For those of us who do not know this practice, it just may be a revelation. So watch the video, and while you are watching, we invite you to do it in a mindful manner. I (Bob Schwarz) would like to add one more practice to supplement what Ron says. What I am about to say will make more sense after you watch the video. Communications about what is going on with my client? Helpful communications for my client? Communications or helpful suggestions about what is going on within me or between me and my client? Continue being with your client, be aware of these things, and see what unfolds. Do they just pass? Do they stick around and get more clear or focused? Sometimes, amazing things can happen when you share the awareness with your client in a frame such as, “As you have been speaking about ______, I having been getting this (name of sensation or image). I was wondering if this means anything to you, especially in connection with what you have been talking about.” In my experience, amazing things can result. How do you know if it is appropriate to share these experiences with your client? That is the topic of another blog. We would love to hear your comments. How do you know when to share these kinds of perceptions? When has sharing gone wrong, and what lessons did you learn? What do you do to stay present? We will be talking a lot more about this at the 17th Annual Energy Psychology Conference. Register for the conference by Feb 17th to get the best price. For everything conference related, visit energypsych.org/2015conference. « Hip Replacement Surgery – The New Paradigm for Energy Psychology? Great blog, Bob! I like the approach of acknowledging whatever comes up as “information.” I find that when I am being mindful and present (and not getting caught up in the trance of either the client’s narrative or my own!) I often have apparently “random” moments from my own experience that pop up and that often serve to do one or more of the following: a) help me understand what the client is experiencing; b) provide an opportunity for me to demonstrate that understanding and/or to allow the client to feel that they are not alone in their experience; c) to say something unexpected that serves either to reframe the experience or provide insight. Other times, what comes up for me are simply words or statements, which don’t have any obvious impact to me, but invariably, when I say them, they have a great impact on the client. This is where mindfulness and presence facilitate intuition: the topic of my breakout in Reston!! 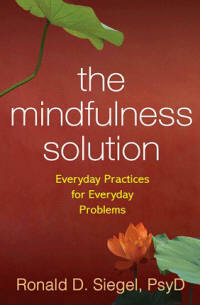 I find that whenever I speak these things – from a place of mindful presence – they are invariably effective in some way. It is when I react or respond from a place of non-mindfulness (i.e. countertransference) that I get into trouble.